Rachel Daughtry has a 10-year plan that leaves no room for mistakes. Or not-so-serious boys—including Oliver Wentworth, the freshman boyfriend she’s never forgotten. Now she’s back in San Francisco with an awesome-slash-scary new job. Unfortunately, The Plan doesn’t cover things like meeting her best friend’s new “secret” guy…Oliver. Fortunately, no one knows that Rachel and Oliver were ever together, and endless bikini wax torture couldn’t make Rachel hurt her friend. But it’s killing Rachel. She’s not over him. Not even a little. And as her 10-year-plan crumbles around her, Rachel realizes that maybe—just maybe—Oliver feels the same way. There is no shortage of fiction inspired by Jane Austen’s works, what is not so thick on the ground are good quality stories that can literally transport you like that of Ophelia London. I adored Definitely, Maybe in Love, a reinterpretation of Pride and Prejudice. I specify reinterpretation because though her work shares many common themes with Austen’s, Ophelia London’s stories have their own unique and individual identity. Unlike Pride and Prejudice, which I have read and watched numerous times, to the point that when my then infant daughter heard the familiar melody of the BBC adaptation starring Jennifer Ehle and Colin Firth she would look up in interest. I am not as familiar with Persuasion, Jane Austen’s last completed novel and have only watched the glorious 2007 adaptation starring Sally Hawkins and the delicious Rupert Penry-Jones. But really who requires more than that as justification for viewing? His presence is almost reason enough to break my oath not to watch MI-5 after they wrote out my beloved Tom played by Mr. Darcy, I mean Matthew Macfadyen, but I digress. I think I was always somewhat disdainful of Anne’s decision to break her betrothal to Frederick for what I deemed to be flimsy rationale, which discouraged me from reading the classic novel or viewing some of the other film versions but I was more than intrigued to see what Ms London’s approach would involve. Someday Maybe alternates between Rachel Daughtry’s freshman year at college when she met and fell in love with Oliver Wentworth and the present, six years following these events. This deviates greatly from Persuasion which only refers to the attachment between Anne Elliot and naval officer Frederick Wentworth in the past focusing exclusively on their meeting after eight years and subsequent courtship. However both stories revolve around a single question: Will the heroine and Wentworth be reunited in their love? A scholarship student Rachel’s inability to balance her relationship with Oliver and manage her studies is a recipe for disaster. Knowing her brother would not approve of her having a romantic attachment at this time when her attention should be solely directed towards scholastic achievement she opts to hide her relationship with Oliver. Six years hence despite her recommitment to the “10 year plan” it is evident that Rachel is not over Oliver and that the job is not working out the way that she imagined. 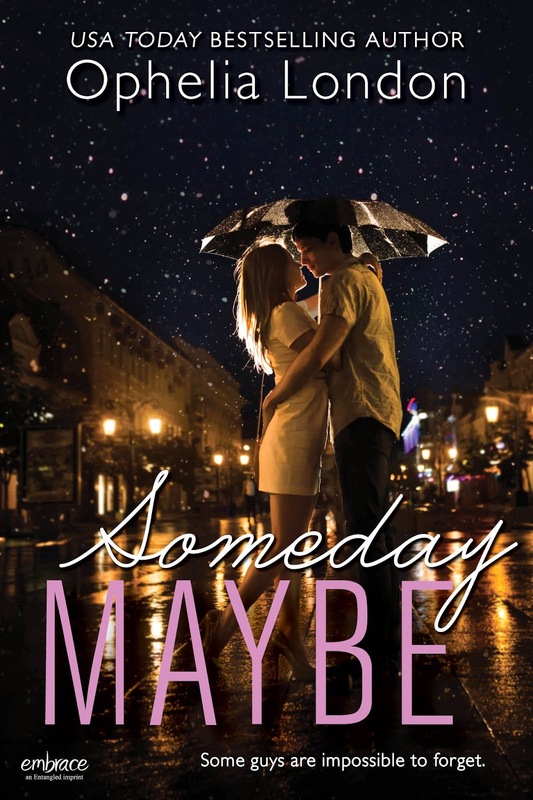 Ultimately Ophelia London proves with Someday Maybe that the success of her first Austen interpretation Definitely, Maybe in Love was not a fluke perfectly capturing the longing and remorse at the heart of the original. Even if you are not an admirer of Jane Austen’s novels, if such a being exists, I would still recommend this story to all fans of love stories in general. I for one am greatly looking forward to what she will come up with next. USA Today bestselling author Ophelia London was born and raised among the redwood trees in beautiful northern California. Once she was fully educated, she decided to settle in Florida, but her car broke down in Texas and she’s lived in Dallas ever since. A cupcake and treadmill aficionado (obviously those things are connected), she spends her time watching art-house movies and impossibly trashy TV, while living vicariously through the characters in the books she writes. 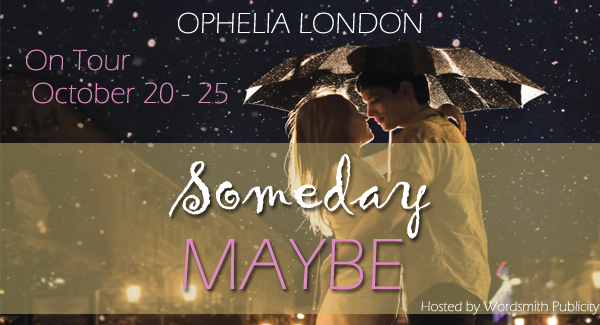 Ophelia is the author of SOMEDAY MAYBE; DEFINITELY, MAYBE IN LOVE; ABBY ROAD; the Perfect Kisses series including: FALLING FOR HER SOLDIER, PLAYING AT LOVE, SPEAKING OF LOVE, and MAKING WAVES; and the upcoming Sugar City series for Entangled’s Bliss line. Visit her at ophelialondon.com. But don’t call when The Vampire Diaries (or Dawson’s Creek) is on.